I’ve been a bit crunched for time lately, and thankfully a bowl of Müesli, Kefir, and Fruit takes only about 3 minutes to put together — though I like to let it sit for about 10 minutes to soften. In the morning I’ll mix up a bowl, take a shower while it sits, and then chow down after I get dressed. This is a great way to kick-start your day with fiber, protein, vitamins, and a bit of natural sugar. Easy and delicious — two of my favorite words! also makes a nice one (that’s also great as a hot cereal). Obviously, feel free to use any fruit you have on hand (preferably in season, of course). Chopped nuts also make a nice addition. Add Müesli and Kefir to a bowl and stir. Let set for a few minutes to soften. If you don’t know much about Müesli, Wikipedia has a good overview. If you don’t know much about Kefir, here’s the quick description: It’s like drinkable yogurt. It’s perfect to add to the Müesli, since the oats are uncooked and tend to absorb a lot of moisture. 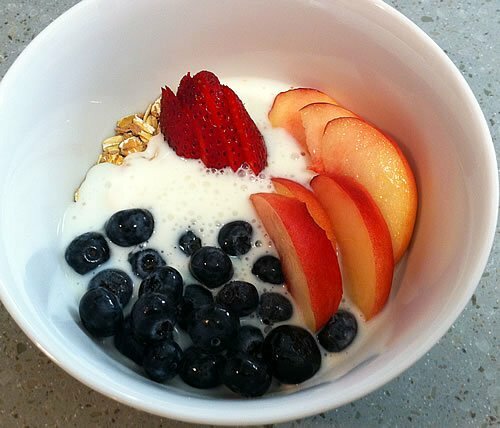 If you use regular yogurt, simply thin it with milk until you reach the desired consistency.